Dried Szechuan Peppercorns, serrano chili and garlic cloves give these chicken wings an Asian flair. Pair these delectable wings with a side of steamed rice or pan fried noodles. RecipeSavants.com Dried Szechuan Peppercorns, serrano chili and garlic cloves give these chicken wings an Asian flair. 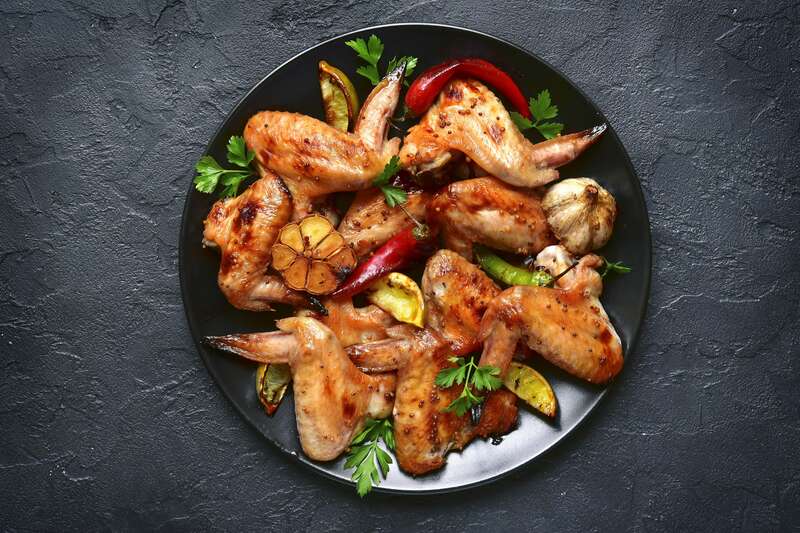 Pair these delectable wings with a side of steamed rice or pan fried noodles. Smart Recipes, Asian Recipes, Chicken Recipes, Recipes Chicken Asian Asian Pepper Chicken Wings PT40M Serves 8 Ingredients: 1 Tablespoon Salt 1 Teaspoon Dried Szechuan Peppercorns 3 Cups Peanut Oil 3 Tablespoons Flour 1 Pound Chicken Wings 2 Garlic Cloves 1 Serrano Chili Heat a small skillet over medium heat and cook peppercorns and salt for about ten minutes, stirring continuously. Remove from heat and keep aside to cool. In a spice grinder, grind the toasted peppercorns until ground. In a shallow dish, combine flour and 1 teaspoon of salt and pepper and mix well. Coat chicken wings with flour mixture evenly. In a large deep skillet, heat oil to 350 degrees and deep fry chicken wings in batches for about eight to ten minutes. Transfer wings onto a paper towel-lined plate to drain. Immediately, sprinkle with salt and pepper. In a skillet, heat 1 tablespoon of the frying oil over medium heat and cook garlic for about two minutes. Add the serrano chili and cook for about two minutes. Top chicken wings with garlic mixture and serve.